Jeremy: This was another one of the major disappointments for me this season. I had big aspirations for Brandon Workman, but he just never put it together. Sure, he was OK in spots, but during the bullpen saga in September, the setup man role was there for the taking, and Workman shrunk in the spotlight. He was rumored to be great in the playoffs because of his 2013 performance, but even in October Workman came up small. So much so that he got replaced by… wait for it… Drew Pomeranz. You know you have sunk really low if Pomeranz gets in ahead of you. Jordan: This is where I steal Jeremy’s analysis for Blake Swihart. I don’t think we got enough of Brandon Workman last season to accurately analyze the season he had. He was good for stretches, then seemed to get optioned to Pawtucket at the most inopportune times. When he came back, he’d be so-so. We all know he wasn’t the pitcher getting drilled in Game 1 of the ALCS, he just has too much talent for that. Jeremy: Steven Wright couldn’t start the season because he was hurt. Then, he got healthy, and he had to sit out another 30 due to suspension. Then, he got hurt again in August, and was added to the postseason roster only to, you guessed it, reinjure the same knee that ailed him earlier in the year, sidelining him for the rest of the season. His suspension was due to domestic violence, so I guess karma is something that rhymes with pitch huh? Something Wright did little of in 2018. Jordan: I mean, Steven Wright was phenomenal in the bullpen down the stretch for the Red Sox — the point where he even registered a save in September, and garnered a postseason roster spot. However, he never pitched in October. He was always in the dugout, or chilling out in the bullpen. Never in the game though. This was due to the same knee injury that sidelined him throughout 2018, and most of 2017 as well. So it’s a little bit hindering to his grade, which otherwise would’ve been fairly good. Jeremy: Another massive disappointment for me, but I fully admit I have bias here. I have never liked Matt Barnes, probably because it always seemed coming into 2018 that he let the Sox down in big moments. This year, he did not disappoint. While twirling a solid stat line throughout the year, he was unable to fill Joe Kelly’s role once the right faltered, and despite having perhaps the second-best stuff in the pen was relegated to sixth inning duty in the playoffs. Now he’s being asked to fill Craig Kimbrel’s shoes as closer if Kimbrel does indeed leave (which all signs point to). That’s an awful big ask of Barnes, and let’s just say I have my doubts as to whether he can deliver. Jordan: It’s encouraging for me seeing Matt Barnes pitch to his fullest capabilities last year. That being said, it didn’t come without any adversity. Barnes has continued to take steps forward each year he’s been in the league, which was on full display in 2018. 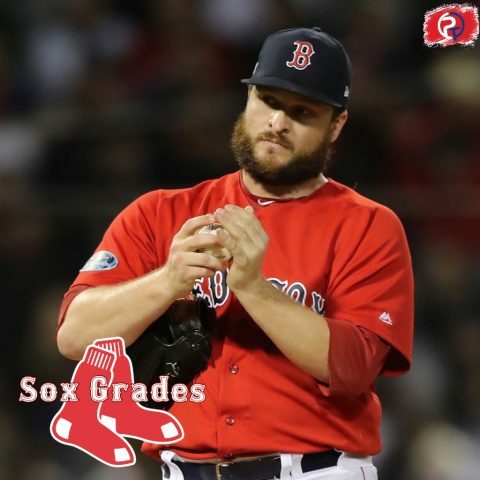 If it weren’t for an abysmal 9.64 ERA in August, combined with a hip inflammation injury that hindered him to just 5.1 subpar innings in September, my grade on Barnes would be through the roof. People forget that he only allowed one earned run in the 2018 postseason as well. While Jeremy will never admit it, he was “nails” this postseason. Jeremy: Every season with Dave Dombrowski at the helm, the Red Sox have made an acquisition for a reliever that made an impact down the stretch. First Brad Ziegler, then Addison Reed and now Ryan Brasier. While Brasier was more under the radar than the other two, he was still a big pickup nonetheless. He wasn’t able to handle the setup role, but the seventh inning was his role throughout the playoffs. His pitching against Gary Sanchez showed me the fire in him, and I look forward to him hopefully being a major piece of this pen going forward. Jordan: What a success story Ryan Brasier turned into last year. Having not tasted the major leagues since 2013, I don’t know how anybody could have anticipated what Brasier was able to do in 2018. I didn’t even really care about what he did in the regular season after he faced Gary Sanchez in Game 2 of the ALDS. I can’t imagine another person with the type of fortitude to yell at Sanchez to get back in the batter’s box, then pump 97 MPH past him for strike three. Animal. Jeremy: Another frustrating reliever, Hembree was never good enough to even garner the sixth inning role. He was unfathomably good coming in with runners on base, which is ridiculous considering how bad it always looked with the eye test. He ate innings, and was able to hold in the playoffs, but it felt like open heart surgery whenever Heath took the mound. Jordan: I think the most shocking thing about the Heath Hembree experience last year is that he actually had a month in which his ERA was below one. He wasn’t good at all, it felt. Every time he came in in a close game, I felt he’d somehow blow it. But like Jeremy said, he was actually really effective with men on base. I don’t understand it, but that’s baseball for you.